Andalucia.com Blog » Blog Archive » Semana Santa in Seville 2015: a whole Holy Week of sun! 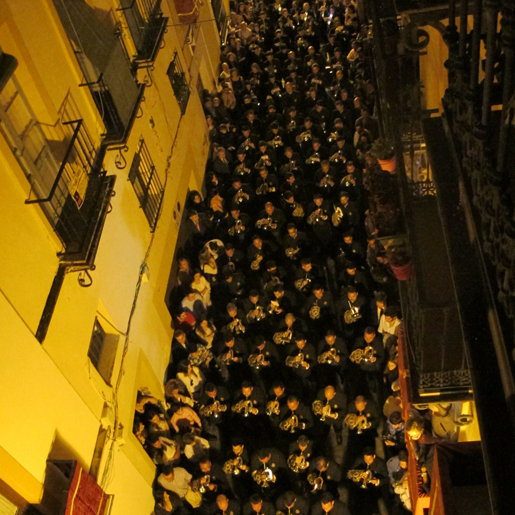 Band of Las Cigarerras of La Carreteria procession in Seville takes up the entire street. No celebration in Spain is as weather-dependent as Semana Santa. At the Feria de Abril, you can duck inside a nearby caseta to avoid a rain shower, nibbling some tasty queso and jamon, and sipping some manzanilla sherry until it’s clear to go outside again. At a food festival, you’re generally safely inside a marquee, restaurant or bar. But in Semana Santa here in Seville, if the heavens open, or the sky simply looks threatening, it’s game over. The statues remain safely inside their churches, instead of being carried through the streets to the cathedral and back again. These adored masterpieces are far too old and precious to risk them getting soaked in a downpour. This year, we had an entire Holy Week (Palm Sunday to Resurrection Sunday) in which the sun shone in a blue sky every day, and the temperatures were in the mid to high 20sC, even 30 – shorts, sandals and sunglasses weather. It was the first complete Holy Week, without any pasos being rained off, since 2006 – that’s nine years of cancelled processions and distraught nazarenos (pointy hats) and costaleros (who carry the statues). In truth, I did find the heat a little wearing – yes, I’m complaining about sunshine in March – and ended up seeing most processions at night, although this was largely because I was lucky enough to be invited to a couple of balconies on evening procession routes – Cristo de Burgos on Wednesday, and La Carreteria on Friday. But this meant that my photos were not great; night-time photography is notoriously tricky, and if your subject is moving, it becomes even more challenging. The advantages of a balcony are that you’re away from the crowds, you can sit down and have something to eat without watching your bag – it’s more relaxed; but that’s also the downside – I love the buzz of the street. So the ideal combination is a mix of the two – the rarified lofty viewpoint, and the in-with-the-masses street-level perspective. The complement each other perfectly, in my view. The Madrugada (early hours) Jesus del Gran Poder is one of the city´s most venerated religious works of art. I got in with the crowds on Thursday night, for La Madrugada, known as La Madruga’, a series of night-time processions starting at 1am – people stay out until the next morning watching the pasos at various points around the city, fortifying themselves with beer, and later churros and chocolate. This is hard-core festivalling, as only the Sevillanos know how. Jesus del Buen Fin in Plaza del Salvador, Seville. The temperature at night was a delight – mild enough not to need a coat, and feel comfortably just right – more pleasant than day time, just without the light. The nazarenos must have suffered, dressed from head to toe in sun-soaking black, in hooded robes, with only their eyes exposed to the air. Did you see any Semana Santa processions in Spain this year?